The kids love story time at night- looks like the dogs do too! It was cold the other morning- rainy and dreary, so the kids wore hats. At one point while we were in the car, I looked back at Cassie and she had her hat backwards so you couldn't see as much of her face. She also had her sunglasses on, but I didn't get a picture of that. Here is the new puppy Flynn! He's very adorable! The kids absolutely love him! Ender was unsure of him the first couple of days, but he only displayed a lip curl/half snarl- saying back off! Now they play together really well and rest near each other. We love the little divot on the back of his back fur where his tail curls up and over, and he seems to be quite the snuggle pup. Wow! It certainly has been a very, very, very, long time since anyone in this family made a posting! And let me tell you A LOT has happened! If you... have seen us, talked to us, follow us on Facebook, or have seen anyone in our families, you probably know about some of the things that have been going on since, oh what, July? And I can't even begin to recount all of the things that have happened since then- BUT, the two biggest things that have happened to our family is/was- Flynn the puppy was born August 26th and joined our family the Wednesday after Thanksgiving. 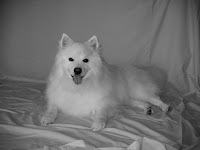 We got him from the same breeder that we got Ender from, yup, that's right another Eskie! And the other big thing we are looking forward to is the arrival of our third child (second GIRL!) at the end of February/beginning of March! So that's probably just the tip of the ice burg of the things that are going on with us, I hope to post more, even if it is only a picture, or a little something of the cute things the kids say and do. And, I might put up some random pictures, but I'll try my best to remember when they were taken, but if not that at least a brief explanation! So! Let the blogging resume!